As I’m sure is currently the case with many of you, my students are working on Christmas pieces along with their usual assignments. As usual, a few of them have encountered rhythmic “simplifications” in their arrangements (Away in a Manger and Go Tell it on the Mountain come to mind). After pointing it out the difference between what they played and what is on the page, together we made the executive decision to play the rhythm as it is normally heard. We also took a moment to discover what is the actual rhythmic notation of the tune and then marked it in the score above the staff. For a more complete discussion of this issue, check out this Forum Q&A post regarding rhythmic simplification in arrangements. A few of my students in particular are really thriving on these Christmas pieces! Once again, I am reminded of the value of learning familiar tunes. I find that it gives students an extra boost in learning their pieces, since they can depend more on their ear for pitches/rhythms rather than their eyes. This means they will learn the pieces quickly and more accurately. I also find that playing familiar tunes is a huge motivator for students. They love to be able to play tunes they know! 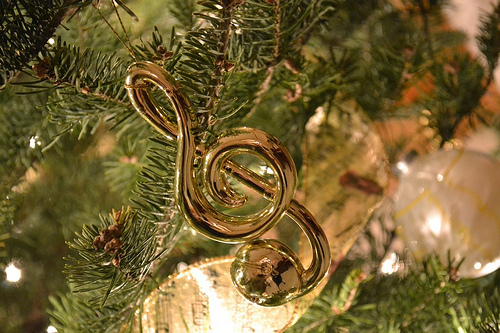 For a listing of free Christmas music arrangements on the internet, check out this post. 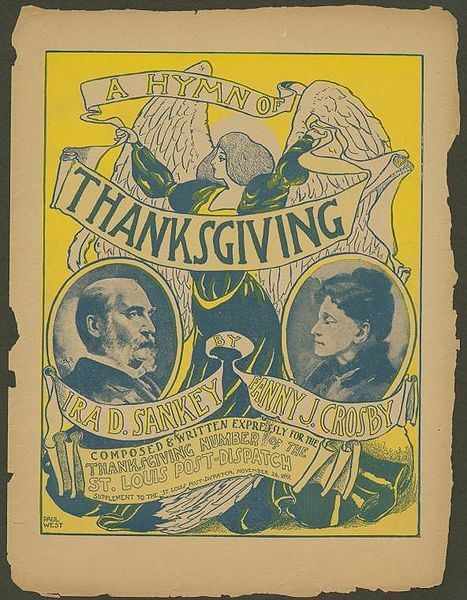 Here in the U.S., Thanksgiving Day is celebrated this Thursday! My husband and I are hosting Thanksgiving dinner at our house and we have lots of preparations to make, so I’m taking the week off from blogging. Thanksgiving blessings to you all! I was recently browsing some forums online and found a description of this game by a music educator. It sounds like a great game to use with large groups of students — perhaps for group lessons or summer camps. I asked the music educator if I could post about the game on my blog, and she kindly agreed. In her own words: “You certainly have my permission to share the game. I made it up, but someone else probably has, too. We all get ideas from one another and put them together in different ways.” I love her attitude and generosity! We teachers have so much we can share and learn from each other. 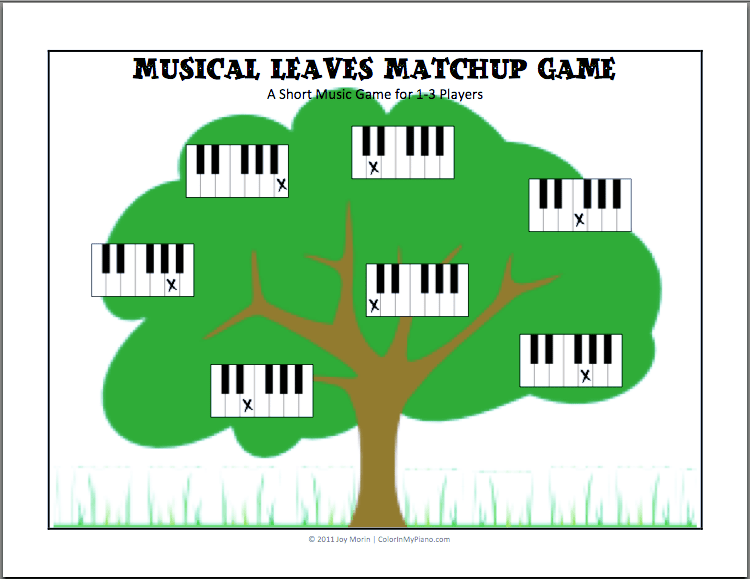 This composing/rhythm game is appropriate for groups of about 8 or more students. All you need are 4 pieces of paper with the numbers 1, 2, 3, and 4 written on them. These sheets serve to mark the beats of the measure, spaced out on the floor. One student is chosen as the Composer, who must select students and make them into quarter notes/half notes/whatever. Once the measure is complete, everyone claps the rhythm and the teacher records the rhythm onto a whiteboard to save it. A new Composer is chosen to compose the next measure. In the end, everyone claps the entire rhythmic composition to see what it sounds like. About year ago, Sheryl Welles posted on her blog about a “Twister Hopscotch” game that she modified into a wonderful music game. Basically, all you have to do is use Avery circle stickers of some kind to make the spinner into a music spinner with rhythmic note values. I finally started my Christmas shopping this past weekend, and this morning I sightread some Christmas duets with a piano teacher friend of mine. :) Now I’m really starting to feel in the Christmas spirit! This December, I’m planning a studio Christmas Party for my students. I’ve never done anything like this before, but I am excited about it. My goal is to plan some music games, make some desserts with cheese and crackers, and hold an informal recital portion too. Each student will play one or two Christmas pieces for each other. I’m hoping to include some piano duets too, and I will probably play a Christmas arrangement myself at the end. Another idea I had was to have each student research the history of their carol and verbally introduce their piece. I’m so excited for the Christmas season! Have any of you been hanging out on Google+ (pronounced “Google plus”) much lately? (If you aren’t familiar with what Google+ is, check out this post on social networking.) Google+ hasn’t risen in popularity as quickly as I had hoped. 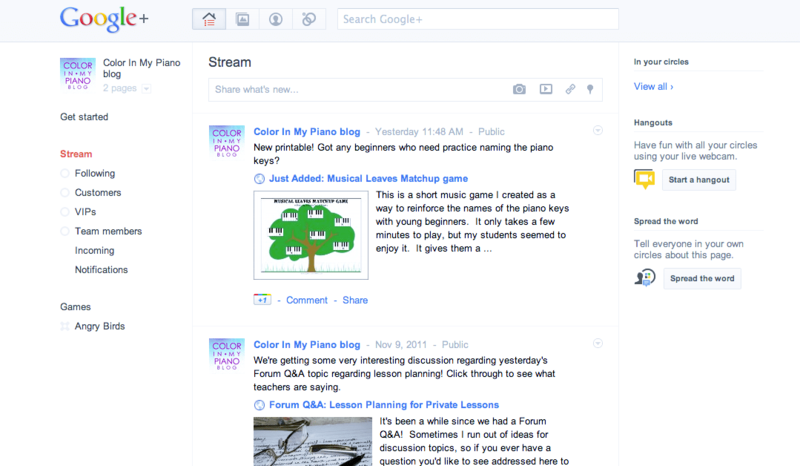 The features, layout, and user-friendliness of Google+ is so much better than Facebook (IMO). And yet, everyone seems to still be hanging out on Facebook. Fortunately, Google+ just announced this week that anyone can create a Google+ page for their business/organization. Maybe this will help make Google+ a thriving place to be! I’ve created a page for Color In My Piano which I’d love to have you all join (click here). Wendy Stevens has also created a page for her ComposeCreate blog, which you can view by clicking here. If you haven’t added me to your circles yet, I’d love to connect with you. My profile page is here. Google+ pages offer a variety of features, including “Hangouts” that allow individuals to group chat (like Skype). 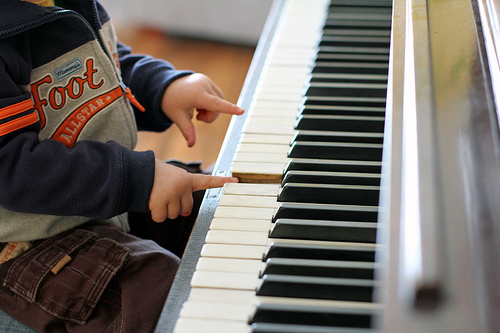 Someday, I’d love to organize LIVE round-table discussions about various piano teaching topics! Wouldn’t that be fun?! So, head on over to Google+. We need more action over there! Last time, we discussed the role of the parent in private lessons. We received some well-thought responses, so thanks for that! Click here to read them, and remember, it’s never too late to add your thoughts. 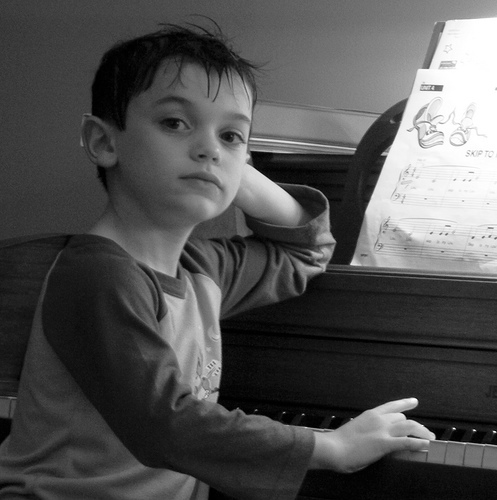 Do you create lesson plans for the private piano lessons you teach? Why or why not? 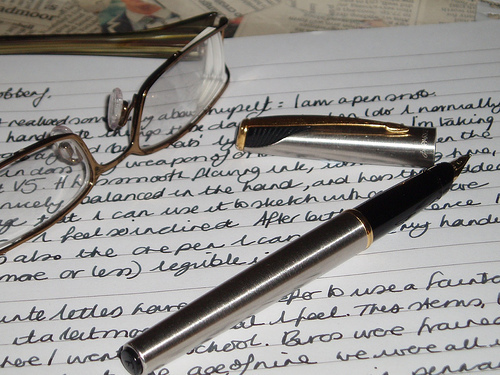 If you do create lesson plans, what is your process? How much time do you spend lesson planning each week? Is your method feasible for even if you full studio of say, 20+ students?